Courage Campaign activist meet in the OEOB auditorium in Washington D.C. Please note: the following post reflects my opinions, observations and reflections alone. I don't speak for the Courage Campaign (the group which organized the trip), nor do I speak for any of the other activists who attended the same meetings. Whether you're a supporter of President Obama, or his harshest critic, I'm going to ask you to hang in there and read what I promise you is going to be a very long post. Because for one day last week this community organizer - with no professional interest in politics, and who couldn't lobby her way out of a paper bag - brought the hopes, fears, and messages of 1,300 others just like me (and you) directly to key White House officials, staffers and cabinet members in a way I never hoped or thought possible. OEOB where we met for the day. On the last week of August, I received one of "those" emails. You know the ones, sincere emails from OFA and the DCCC promising you dinner with the President if only you'd donate $3 by midnight tonight. This one asked, "Would you like to join us at the White House?". Out of reflex, I almost deleted it, except I realized it was coming from someone I actually knew and had collaborated with, Rick Jacobs, founder of the California Courage Campaign. The Courage Campaign would like to extend an invitation to you as a key California progressive supporter and leader for a "California Day" at the White House in Washington, D.C. on September 23, 2011. Organized by Courage Campaign and hosted by The White House Office of Public Engagement, the purpose of this day-long conference is to meet with key Administration, policy, and political experts to talk about issues and plans that affect California. It must be a joke, I thought. No joke, Rick assured me. This was real. If I went, I told Rick, I have no incentive to tone it down. In fact, the only way I'd agree to go is if I were allowed to speak my mind. I'd be respectful, but I would not hold back. "We're counting on it. ", Rick said. And that's how, on September 23d, I came to be in the auditorium of the Old Executive Office Building with a hundred other California activists, DFA organizers, labor and union leaders, non-profit representatives, key White House officials, staffers and cabinet members......giving David Plouffe a piece of my mind. On Thursday, as we flew from LAX to Washington-Dulles, Labor Secretary Hilda Solis was dragged before Darrell Issa to answer for the sins of Solyndra, the solar power company which had gone belly-up despite half a billion dollars in government loan guarantees. Issa, an opportunist who never passes up an opportunity to score political points, hoped to use the hearing to strangle the life out of the administration's green jobs initiative. The title of his latest inquisition hearing? On Friday, as we met with White House officials, the Republican-controlled House was threatening yet another government shutdown. This time the hostages were FEMA and a federal loan program designed to encourage auto companies to develop green car technologies and to keep those green jobs in America. As an added bonus, they also passed the TRAIN Act, a nasty piece of work which would force regulators to prioritize economic considerations over science and health, and would repeal or block new and pending clean air safeguards. "That's one train you don't want to see coming." said one of the officials we met with on Friday. That was the backdrop as a hundred jet-lagged bright-tailed and bushy-eyed California activists filed into the Old Executive Office Building auditorium at 8am on a Friday morning - Washington D.C. as Crazy Town USA - a fact-free zone where Republican politicians demanded, "Where are the jobs, Mr. President! ", even as they worked overtime to cut loose hundreds of thousands of Americans from the workforce. 1) Legally, since we were meeting on the White House grounds, we could only discuss policy. Politics and elections were verboten topics. 2) To facilitate a candid discussion, all remarks were off the record. We could report our impressions of the meetings, but we could not directly quote any individual. And with that, we began. The day they had planned for us was packed. In the morning, we would meet with a number of White House officials and cabinet members, including the Director of the White House Office of Public Engagement, Jon Carson, Deputy Director of National Economic Council, Brian Deese, EPA Administrator, Lisa Jackson, Labor Secretary Hilda Solis, White House advisor David Plouffe, and Chief of Staff, Bill Daley . During lunch, Science and Technology advisor, Dr. John Holdren would run us through the administration's priorities (this PDF file has a good overview). After lunch, we would attend breakout sessions on immigration, education, the environment (I attended that one), housing, LGBT, healthcare reform, and labor issues. Lastly, we would end our day back at the OEOB auditorium, as Jon Carson and Senior advisor Valerie Jarrett debriefed us for a final "listening" session. JOBS, JOBS, JOBS......DID WE MENTION JOBS? The Courage Campaign visit, planned since May, happened to coincide as the administration unveiled the American Jobs Act, a proposal Freakonomics columnist Justin Wolfers called a "very real plan"
- It’s reasonably well targeted. Unemployment insurance extensions will get spent. Infrastructure money gets spent and also builds stuff. As for the payroll tax: Who knows if it gets spent, but the point is to stimulate hiring, rather than spending. - It’s reasonably well designed. The biggest problem with a payroll tax is that firms get it even for employees already on the books. But this time, the biggest payroll tax cut is only for firms raising their payrolls. This will yield a much bigger bang-for-each-buck. Early analyses have yet to realize how important this is. - It’s reasonably timely. The usual argument against fiscal policy is that the spending only occurs by the time the economy is booming again. There’s no chance of that occurring. Perhaps this provides the confidence boost we need to counter double-dip concerns. - It’s reasonably well focused. Tax credits for hiring the long-term unemployed will be very helpful in preventing the current recession doing long-term harm. - It’s reasonably evidence-based. Having the unemployed talk to a jobs counselor before extending benefits can have huge effects at minimal cost. All told, it’s a very real plan and very specific. None of this is magic: Government gets more active when the market fails, and we pay it back when the market booms. This is all standard economics. There’s no gold-buggery, voodoo austerity or laughable Laffer-y. Obama’s not making up economics, he’s using simple tools to solve the obvious problems. Nearly everyone we talked with pushed the AJA. And by "pushed", I mean Deese, Solis, Jackson, and Carson all delved deeply into the bill, providing real-world examples of how it would work, patiently addressing our questions and concerns along the way. Admittedly, I'm no policy wonk (except for some environmental issues), but one thing became crystal clear to me by the end of the day. The administration isn't screwing around - they're serious about passing the bill. And if they can't do it, they want to make sure it's Republicans who correctly get the blame. Is this just election year politics? Maybe. Probably. But the thing is, it doesn't matter. Republicans have been allowed to tank the economy, especially after the 2010 midterms. Frankly and honestly, I believe President Obama and his advisers enabled that to happen. It doesn't do you a hell of a lot of good to be the "adult" in the room if Junior is setting fire to the house. Based on everything I heard that day, along with some reported indications from Axelrod and Plouffe, I think the administration is finally coming to grips with that reality now. So it's my belief the White House has every incentive to bring the fight to the Republicans. If the economy tanks, so does this administration. Obama knows it, Congressional Democrats know it, and the Republicans know it. If I had one takeaway from the day, it was this: Progressives have allies in the White House. Not everyone in the White House, and maybe, sometimes, not even Obama, but I met people that day who were - and they were doing everything they could to indicate to us what activist strategies were working to move congress and the administration. The XL tar sands pipeline demonstrations in front of the White House were noted more than once. So were the actions of aggressive LGBT activists who organized around DADT. Coalition building amongst different activists groups towards common goals was specifically mentioned and encouraged. One official mentioned how Planned Parenthood and Pell grant activists joined forces during the debt ceiling fight to effectively mitigate the damage. That action was directed towards Congress, but was cited as a global example. To me, this just validates what progressives - including Van Jones at NN11 - have already been (endlessly) talking about - that we need to get out of our silos and start joining forces. The White House even came up with a way for activists to force the administration to respond to their concerns. Last week they unveiled "We The People", a site where activists can launch online petitions around any cause or issue that concerns them. If the petition gets 5,000 signatures in 30 days, the appropriate official will have to make a public response. Already there are over a 100 petitions in the pipeline, petitioning for everything from the forgiving student loans to repealing DOMA. Check it out. Give that sucker a test drive. If this administration remains frustrated with Progressives, the officials we met with were doing a good job of hiding it, even when there were policy disagreements about HAMP, the deficit, education and immigration reform. With one exception, it was evident they knew the real enemy wasn't us, it was Republicans and the moneyed interests which back them. With one exception, they were looking for partners, not uncritical worker-bees and ATMs. Which brings me, at last, to Mr. Plouffe. I don't think I would be betraying any confidences to say he was talking at us and not to us, and that even as he called himself a "progressive", he rattled off a list of administration "accomplishment" that set my teeth on edge. If you've ever been on an OFA national conference call, you probably know what I'm talking about. Fortunately, I did not come to the White House meeting "unarmed". A couple of days beforehand I put out a survey to all my activist friends in California, asking them (and you) what they'd like me to say if given the chance. Although not perfect (Nate Silver I'm not), the survey was meant to reflect the discussions we have here and in our communities every day. Thanks to an activist on Daily Kos , who took the ball and ran with it, the survey went viral. In less than 48 hours, nearly 1,300 people from every state but Rhode Island and North Dakota took part. A thousand of you left comments. It was an incredibly powerful tool to bring with me to Washington, and it was known to the White House even before I arrived. Jon Carson even tweeted a link to the survey, encouraging people to participate. The results were not unexpected. Only half the people surveyed who volunteered for Obama in 2008 are considering doing so again in 2012. Only about a third say they'll donate to the campaign. 97% said they voted for Obama in 2008. Only 72% said they would in 2012. My husband and I "did everything right". And we are losing ground in every way. He has been without work for 16 months. He can't find work, can't find interviews. It was only because we lived simply to begin with and did not use credit to overextend and buy that which we didn't truly qualify for that we have not lost the home our five children live in yet. But we can see that day coming. I recently took down the framed front page of the Washington Post on Inauguration Day off my dining room wall. I couldn't look at it anymore. I no longer know hope or believe in change. So when Mr. Plouffe was done, I raised my hand......And started to talk. Careful not to couch the survey in terms of electoral politics, I told him about the enthusiasm gap between 2008 and now. But I also let him know there really was a light at the end of the tunnel, and it wasn't the headlights of an oncoming semi. President Obama's recent push for the American Jobs Act, increasing taxes on millionaires, the bailout of the US auto industry, proposing that the Bush tax cuts expire for anyone making over $250K, emphasis on green jobs and increased auto mileage standards, and support of the DREAM act and DADT, were all widely popular. I am so proud of the president for coming out with the proposal for higher taxes on millionaires. It's so common sense. Please continue to emphasize raising revenue and creating jobs over deficit reduction at this point in our economic circumstances. Two thumbs up for the line "This is not class warfare, this is Math!" Please tell the President to TRUST US that we have his back if he will just STAND UP to the Republican obstructionism happening in our government. It takes two to be bi-partisan, and the Republicans seem to have a hearing problem. Obama could find a cure for cancer and Boehner, Cantor and the rest of them would want to know why it wasn't for diabetes. I told Plouffe (and later Carson), the most remarkable thing about the survey was that a huge percentage of respondents hadn't shut the door on President Obama yet. They said they were "undecided" about their involvement in the coming year. This tells me they're waiting, and watching, to see what this administration does. They're tired and beat up, but they still have hope. If Obama does what he says he'll do, and if he's consistent about it, they'll be ready to stand with him again. To Plouffe's credit, he listened to you. And said he'd be willing to continue the discussion. First, do what you can to help push the American Jobs Act. Don't sit on the sidelines for this one. Call your representatives. Then call your friends and ask them to start making calls. Second, do something for 2012. If you have a beef with how the Obama administration has governed for the last three years, I will not be the person to tell you your issues aren't legitimate. I have serious concerns with how President Obama and his advisors have handled everything from the Stupak amendment to the debt ceiling crisis to Gitmo. Spending 8 hours on the White House grounds does not erase any of that. However, here's what that day in Washington did make clear to me; if President Obama loses in 2012, even if we take back the House and hold on to the Senate, our country will be well and truly screwed. Because Issa and Ryan-worshipping Republicans will infest every level of the Executive Branch. Hilda Solis. Gone. Lisa Jackson. Gone. Dr. John Holdren. Gone. Green jobs. Gone. The EPA. Gone. Look, if you can't get your head around working towards reelecting Obama, find some progressive Congressional candidates and help us take back the House and put the gavel back in Nancy Pelosi's hands where it belongs. Or, how about working to get Elizabeth Warren elected to the Senate? Because it would be a heck of lot easier to elect her President in 2016 if she were a sitting Senator, and didn't have to run against an incumbent Republican President. If the last three years have taught me anything, "change we can believe in" has to come from us. Our work doesn't end with an election, in fact it's only just begun. Washington is about inertia and holding on to the status quo. I don't care how promising the politician, once they get behind those marble walls their world gets very small. They cannot and will not do what we elected them to do unless we help them, or force their hand. This is true even of Republicans, and something the Koch brothers, Wall Street, and the PACs funding the Tea Party movement understand all too well. Doing nothing in 2012 may not be an option, but, as it turns out, doing nothing after 2012 isn't an option either. Click on this link to see all my photos from the weekend. My deepest gratitude to Rick Jacobs and the Courage Campaign for organizing the day, for Jon Carson and his staff at the Office of Public Engagement for facilitating, and to the hundred California activists who travelled to DC at their own expense to make their voices heard. What Do You Want Me To Tell The White House On Friday? If you were in a room with David Plouffe, Valerie Jerrett, and other members of President Obama's inner circle, what you say to them, right now, if you had the chance? Think hard about that, because if I have my way, you'll get that chance. I've been asked to be a part of the California Courage Campaign's delegation of activists and organizers who will meet with top White House staff and advisors this Friday to participate in the White House's Community Leaders Briefing Series. Since I'm going in my capacity as a community organizer, I feel it's important to use this opportunity for unfiltered access to make sure your voice heard. Click on this link to fill out our short survey. VERY IMPORTANT: THE DEADLINE FOR FILLING OUT THE SURVEY IS 7PM THURSDAY. My apologies for the short notice, but I will need time to tabulate the results so I can present them to White House officials on Friday. Won't you take 5 minutes to fill out a short survey at this link to let the Obama administration know what you care about most leading up to the 2012 elections? Now is the time. Take ownership. Make your voice heard. Last November, when Betsy Butler won her first election to become an Assembly member for AD53, she told her new constituents, "I will never forget your support and dedication to my campaign." Now, only 10 months later, Betsy Butler has a different message for those same constituents, "Thanks for the memories." Butler went on the record Thursday to the Argonaut Newspaper and Palisades Post, ending months of speculation on her election plans for 2012; she will be moving north to run in the new AD50, a district which will include Santa Monica, West Hollywood, Beverly Hills and Malibu. Butler said she is more compatible with the new 50th District and that is one of the primary reasons, in addition to her love of the Westside, why she will be moving to the new Assembly district. Reaction from Bulter's current constituents - hundreds of whom had signed our petition pledging donations and campaign support if she stayed in the South Bay to run against Tea Party candidate Nathan Mintz - ranged from disappointment to resignation. "Lots of people here in the South Bay worked hard for Assemblywoman Butler in the last election because they felt she best represented their interests and those of the district," said Tony Salvaggio, a Manhattan Beach constituent who signed the petition. As an aerospace engineer, Salvaggio expressed concern that losing Butler would adversely affect one of the South Bay's major industries, "As the Chair of the Select Committee on Aerospace, she has a critically important voice for the top industry and employer in the district." Both privately and publicly, Butler defended her decision by saying redistricting made it impossible for her to win in the more conservative AD66. In the 2010 race for AD53, Butler beat Nathan Mintz 50.2% - 43%. Butler also says she plans to identify herself on the AD50 ballot as "incumbent" even though she's never represented the area and has lived in Marina del Rey - and outside the district - for over 20 years. Butler said she justifies the "incumbent" designation because of a 1 square-mile overlap between the old AD53 and the new AD50, saying she currently represents 8,000 - or 1.7% - of the new district's 470,000 constituents. Below are two maps putting that overlap in context. In the second map, the new AD66 is added in red. The orange area between AD53 and AD66 shows the much larger overlap between Betsy Butler's current district and the new South Bay district - 34% (or 160,000) constituents. Several individuals who spoke with Butler about our petition told me it apparently had no effect on her decision, except as a public relations matter to be handled in the media. Publicly, Butler and her campaign have dismissed the petition, claiming it the work of Torie Osborn supporters in an attempt to "clear the field" for her. Osborn is one of two democratic candidates already running in AD50, the other Santa Monica mayor, Richard Bloom. As proof, Butler's campaign pointed to some of my photographs that appear on Osborn's campaign website. However, in doing so, Butler's campaign failed to disclose that my work also appears (uncredited) on her official Assembly website. Photo I took of Butler on March 12, 2011 which appears on her AD53 website. South Bay signatories dispute the characterization, "I wouldn't know Torie Osborn if she walked in my front door," said Salvaggio. Privately, Butler attempted to reach out to her soon-to-be former constituents, telling some they were welcome to come north to walk precincts for her. Activists she spoke with were incredulous. "She's delusional," said one South Bay activist who asked to remain anonymous. "No one is going to be walking precincts for her in Santa Monica while we're down here fighting to keep the South Bay blue. She turned her back on us." South Bay activists expressed concern that Butler's move meant the California Democratic Party and Assembly Speaker John Perez had given up on their district, where registered Democrats outnumber Republicans by only 3%. Published comments from Butler's Westside supporters left little doubt they were unconcerned over who would represent the South Bay next. "To be clear, Betsy Butler may choose move to the newly drawn district as befits a liberal incumbent legislator and by doing so, will remain with us in Venice, because our votes got her elected in the first place," said Venice neighborhood council President Linda Lucks. "Venetians should clearly be happier to lose the conservative part of the District... I know I am.."
Speculation was also fueled when reports surfaced that Perez was behind Butler's move. Insiders report that Assembly Speaker John Perez is making calls to ask incumbents to move into new districts. One such Assembly member to receive a call from the Speaker, according to sources, is Betsy Butler, who currently resides inside a district in which Steven Bradford, another Assembly member, now holds a seat. Sources I spoke with told me Bulter's campaign claimed the Assembly Speaker would commit up to 2 million dollars for her in the AD50 race. However, Perez's office denied any direct involvement in Butler's decision or campaign. Perez spokesman John Vigna said the Assembly speaker on previous occasions has asked all Democrats do what they think is best for the party. “The speaker has said to every member of the Democratic caucus many times that they should consider their options with respect to redistricting and make the best decisions for the Democratic Party and the Assembly caucus,” Vigna said. Perez's clarification was welcome news for Dency Nelson, a Hermosa Beach environmentalist and member of the Beach Cities Democratic Club who supports Butler's decision, "It would behoove the California State Democratic Party to re-direct its money away from the solidly Dem 50th and take a gamble with us in the 66th." Referring to Democratic candidate Debra Bowen's surprise Assembly win in 1992, Nelson said, "We did it before, we can do it again. Give us some support, a good candidate, and maybe we can give the state another 1992 surprise!" YES WE DID! Shark Fin Ban Passes CA State Senate! Today, the Senate voted overwhelmingly to pass AB-376, which will make the sale and possession of shark fins illegal in California. All it needs now is Governor Jerry Brown's signature to become law. Only a couple of weeks ago, there were fears the legislation was dead. But thousands of Californians and dozens of environmental organizations banded together to put enough pressure on reluctant politicians in Sacramento to cross the finish line. This was truly a grassroots campaign. I'm reminded of a favorite mantra from the 2008 Obama campaign, "One Voice." And if a voice can change a room, it can change a city. And if it can change a city, it can change a state. And if it can change a state, it can change a nation. And if it can change a nation, it can change the world. For me, that voice belongs to Sue Chen, an amazing activist from Manhattan Beach, who's been working countless hours to spearhead this campaign in Southern California. It was an editorial she and Mark Gold wrote for the Daily Breeze which detailed Ted Lieu's opposition to the shark fin ban, that spurred my involvement. The most critical senator on this issue is the South Bay's own Ted Lieu, one of the few Asian-American members of the Legislature. But Lieu has not supported a legislative ban on the sale of shark fin products. Instead, his suggested alternatives include banning fishing for sharks off California or even banning the sale of all shark products in the state. Both of these ideas may sound positive on first blush, but they do not have any realistic chance of being passed in Sacramento. And you can imagine how popular these amendments would be with the state fishing industry. More important, shark finning globally, not any activity by our local fisheries, is the major cause of the decimation of shark populations. A state bill that specifically targets the sales of shark fins will have the greatest impact on helping critical shark populations recover. After reading that, I knew I had to act. Being that Ted Lieu is my State Senator, I thought he might be interested in knowing that many of his constituents opposed his position. So I started a petition at Change.org and sent a message out to the Venice For Change 5,000+ district-wide email list asking for signatures. What I didn't know then was that Lieu's amendments were on the verge of killing the bill in committee. Some of the Senators, who weren't knowledgable about the intricacies of the shark fin trade, wavered. Their votes disappeared. But in just a few days, over 900 people signed the petition. Every signature triggered an email which went directly to Senator Lieu's office. Lieu suddenly began engaging on Twitter and with constituents via email. In the end, he refused to vote for the bill. But he did agree not to push his amendments. Five Senators voted to approve the bill in committee. The exact number it needed to pass to get it on the floor for a final vote. Even as we wait for Governor Brown to sign this bill into law, activists are already talking about their next actions - in Toronto, Vancouver, and even Hong Kong. 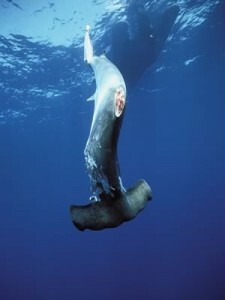 Their goal, a world-wide ban on the sale and possessions of shark fins, and an end to a brutal and wasteful slaughter. Thanks to you, Sue Chen, and countless others who never stopped believing, that reality is one step closer. Today, Chen sent out a message to the amazing activists she connected to in this fight. Tears are rolling…this has been a personal mission and one that I had no idea would be so emotional and inspiring. Over 150,000+ Californians took action for what they believed in - participating in numerous petitions, calling Senators, shark rallies, newspaper comments, twitter wars and more. This was truly the voice of the people overwhelming and defeating very determined and powerful moneyed interests in Sacramento. Thank you for listening to all of my shark talk these last few months and helping me believe that this could get done! 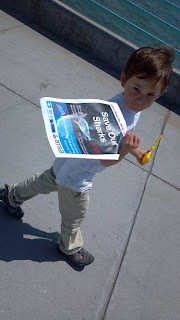 Special love and hugs goes to my 4 year old nephew Bryson, who personally evangelized to over 100 strangers, raised $1,000 and came up with a master plan to take away the shark hooks from the fisherman, hide them in his corn garden and punish the shark finners with a time out of 100 minutes. That’s passion and why we do what we do. URGENT! Shark Fin Lobby Buying Opposition to CA Ban. Call your CA Senator TODAY. This morning I received an alarming call from Sue Chen, the South Bay environmentalist who's been spearheading the shark fin ban effort in Sacramento. The California State Senate has unexpectedly scheduled a vote on the ban for tomorrow. And, despite the fact that 85% of Californians, and 70% of Chinese-Americans polled support a ban on the sale or possession of shark fins in California, the ban is looking like it may not pass. The international shark fin trade, who has hired the same lobbyists representing Phillip Morris and Walmart, are literally buying off CA Senate votes with threats to withhold campaign contributions. Their hard-ball tactics seem to be working. Senator Curren Price, who was a "yes" vote in the Senate Appropriations Committee, has said he'll vote "no" when the bill comes to the floor. He is but one example. We need you to call your CA Senator TODAY. Even if your Senator is a Republican, since the bill does have bipartisan support. Tell them you want them to support the ban on the sale or possession of shark fins in California.